Necco Wafers have been saved! Yesterday, the classic American candy company was sold at auction to Spangler Candy, makers of DumDums suckers, Saf-T-Pops, and – yes – the not-so-beloved Circus Peanuts. 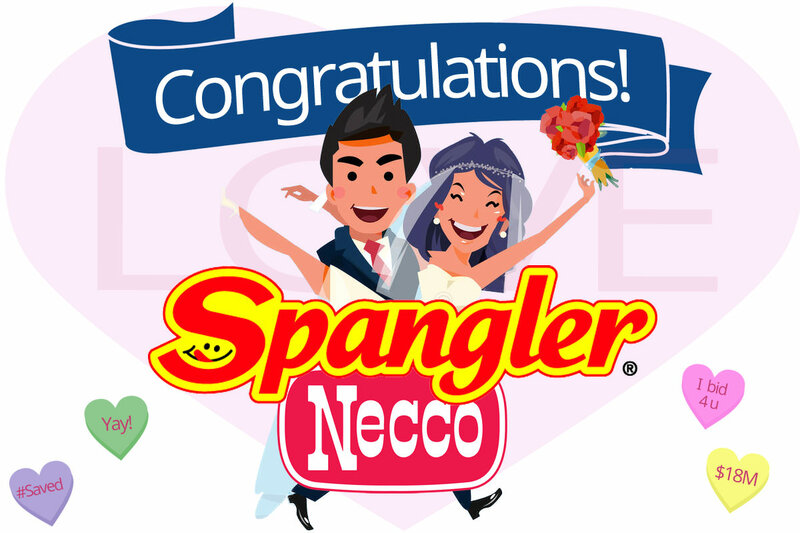 Spangler’s bid of $18.83 million beat 2 other offers, including one from former Necco CEO Al Gulachenski’s group, Round Hill Investments. Over the past few months, CandyStore.com has actively supported the #SaveNecco campaign. We worked to spread awareness of Necco candy’s popularity and the Great Necco Wafer Panic and, working with Gulachenski, and a GoFundMe campaign to save the Boston-based company. While we are sorry Al and his team were not the winning bidders, Spangler’s acquisition appears to be a good outcome for the future of Necco brands. Spangler is a fourth-generation family run candy company, and all sources seem to think they will continue the Necco brands into the future. The good news is that Necco Wafers and Sweethearts will survive! Your efforts and the publicity generated by this gofundme played a big part in the sale. The campaign also generated interest from others that were part of the proceedings yesterday that may not have happened without this effort. First and foremost we need to thank CandyStore.com for generating the interest in the story and for breaking the news of our gofundme site. Please make sure you all get your Necco wafers from them in the future. Aw! Al, your stepping up definitely influenced how the sale of Necco went and helped to ensure the brands will go on. On behalf of everyone at CandyStore.com and Necco fans everywhere, thank you! And to all you Necco candy lovers out there, thank you! By rushing to buy Necco Wafers in a panic last month – even offering to trade in your 2003 Honda Accord – you made it clear that Necco candy is still popular and deserves to live on. It was your actions that spoke so loudly and saved a legendary candy company. Now to some details. This has been a delivering drama for the past few months so here are some answers to questions you might have. 4th Generation. Spangler is run by the same family that founded it. At the auction, the bidding started at $15.2 Million. Gordon Brothers, a company known for taking companies apart and selling them (remember Pretty Woman?! ), were originally set to buy Necco. Oh no! Then a bankruptcy judge ruled that an auction could get a better price. Had they succeeded, it’s likely they would have sold it off for spare parts like Richard Gere’s character. It looks like the judge was right, too! The Gordon Brothers’ bid was under $14 million. Which is like $5 million less that $18.83 million. Did the news of The Great Necco Wafer Panic contribute to the judge’s opinion? Will Spangler Make All Necco Candy Now? Spangler’s intentions are not clear as of yet. It has been speculated that the sugar candies like Necco Wafers and Sweethearts will be their focus. Chocolate brands like Clark Bars and Sky Bars might not make the cut. If they decide to focus on the sugar line, a sale of the chocolate brands to a chocolate-focused candy company seems likely. Again, we have no hard information to base this on as of yet. Just talk. We’ll continue to monitor the situation. How can I get my GoFundMe contribution back? As far as your donations, we can instruct GoFundMe to return all of your money (this may take 7-10 days). Will Necco Stay in Boston? Necco’s current location has been cited by current and former CEOs as having too much overhead. So, it seems certain that Necco will relocate. But where? Spangler is an Ohio-based company. Though nothing has been announced, it seems likely Necco products will be produced where Spangler currently produces their candy. However, Necco has a rich tradition in New England, so don’t count out the Boston area either. The deal with Spangler fell through. I guess they couldn’t pull together the money they needed to close the deal. After winning the auction bid process, Spangler asked for a discount. When the judge refused, an second round of bidding ensued. The winner turns out to be the same guy who rescued Twinkies! The sale price was a little lower than the first time – $17.3M. Still, the result seems to be the same for candy lovers: Necco lives on. Ok, back to Spangler now. Spangler has purchased a portion of Necco’s assets: essentially Necco Wafers, SweetHearts and Canada Mints. The seller is an unnamed entity that purchased these assets from Round Hill Investments. Spangler has also announced that it purchased an additional 20 acres of property near its current facility in Bryan, OH. It will use this land for additional warehouse and production facilities in the future. This was previously owned by New Era, Inc and would need significant renovation to be certified for food production. Other Necco brands have been sold off to various other candy makers as well, either privately or via auction. The Necco candy brands are starting to surface at their new homes. Get a full update of where the Necco candies stand today in our article about the one-year anniversary of The Great Necco Wafer Panic. If you have more questions about Necco candy’s future, or need anything at all, please contact me at the email below. Not only were Necco Wafers one of my favorite candies back in the 60’s (the chocolate and licorice flavors especially), they also made perfect little bb-gun targets. It was so fun to set up targets lined up on the ground in front of a cardboard stand (think Scrabble letter holder), you could also tape them to kite string and let them swing back and forth. Can you guess which Necco Wafer colors were most likely to end up as targets? Use your bb’s 4 hitting choc. ones…YUK. ALL Other NECCOS are all my favorites. Please someone, make them ASAP, I’m on my last box. Can’t wait to buy more. Cracker Barrel used to carry them; hope they get them back.